Throughout his life, Thomas Jefferson constructed a seemingly impenetrable wall between his public legacy and his private life, a tradition upheld by his family and his white male biographers. Now, Virginia Scharff breaks down the barrier between these two spheres to offer an intriguing new portrait of this complicated and influential figure, seen through the lives of the most important people in his life: the women he loved. "This book is a tour de force; a must read for all who are interested in early America, Jefferson, and Monticello." "A focused, fresh spin on Jeffersonian biography." 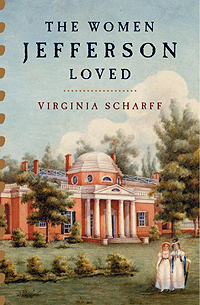 "A smart, eye-opening, vividly written saga of Monticello. It's an indispensable portrait of Thomas Jefferson like none other." "Moving, brilliantly written and deeply sympathetic to everyone concerned, it is a wonder." "Opens a window to the heart and soul of one of our nation's founders." Site design © & maintenance by xuni.com. All content © 2010-2019, Virginia Scharff.